The ECO150 Dehumidifier is another addition to the EIPL range of “Eco Friendly”, Carbon reducing, range of dehumidifiers. The ECO150has a maximum l/kWh (water extraction per kW of power consumed) of 1.81 l/kWh. This is achieved by utilizing a high capacity rotary compressor and environmentally friendly R407c refrigerant. The robust collapsible handle and semi-pneumatic tyres ensures transport and maneuverability are not compromised. It’s lightweight yet robust design is ideal for commercial and residential work. Its compact size permits one-man operation, yet it has the capacity to handle several room-size areas at a time. Best of all, it’s affordably priced within the budget of most restoration specialists. The Hours Run Meter provides an accurate means of measuring power consumed, allowing jobs to be easily and quickly evaluated when requested by insurance companies. 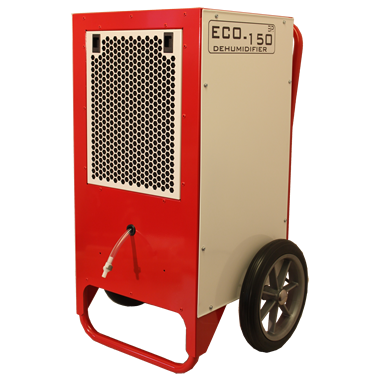 The EIPL ECO150 Dehumidifier is a rugged, yet mobile piece of equipment that will operate under extreme conditions and pull large amounts of moisture from the air. Whenever there is a need for fast dependable, energy-efficient drying, EIPL can provide the answer. The high efficiency Rotary compressor, balanced refrigeration system, and high performance backward curved fan, ensures the maximum extraction with the lowest running costs. EIPL are a recognized world wide supplier of flood restoration drying equipment. We offer a variety of dehumidifiers and air movers to remove water and assist with drying areas after water damage. Following a flood, whether it is in your basement or office, it’s vitally important to restore the damaged area to good order as soon as possible to protect your health from microorganisms, mold and bacteria that may grow and ultimately prevent further damage. Whether it is a flash flood, hurricane, heavy rains or water main break, EIPL have the equipment to handle the harshest environments and assist with proper restoration.